Yet another round in the West Indies Professional Cricket League (WIPCL) where there were victories in all three matches. Trinidad and Tobago Red Force had a 180 degree turn coming off an innings defeat at home to the Guyana Jaguars. Inflicted a similar result over the Leeward Island Hurricanes. Red Force were led by Imran Khan who scalped seven wickets in the match along with a rearguard unbeaten 84 to win the man of the match. Khan was aided by Khary Pierre 5/44 in the second innings and Roshon Primus 4/57 with the ball in the first innings. Kyle Hope 84 and Amir Jangoo 96 set the tone for the Red Force innings with a 184 run stand opening partnership. Like the Red Force, Jamaica Scorpions recorded their second win of the campaign with a ten wicket defeat of bottom side Windward Islands Volcanoes. The the effervescent Devon Smith continued to exuded perspiration from the fountain of youth with 116 and 41 but had little help resisting Nikita Miller’s Scorpions. As it was Miller himself leading the way with a half century (52) off the bat and a 13 wicket-haul with the ball 5/60 and 8/54 earning him the WIPCL player of the round (5th). Miller had support from Fabian Allen who is building a reputation for himself with an unbeaten 105, Allen currently averages 50 plus in First Class (batting). The every reliable John Campbell scored 71. The question circulating around the Caribbean is, “who is going to stop perennial champions Guyana Jaguars?” The Jaguars always seem to have players standing up for the cause, if the spinners are not putting in the work the quicks are up for the task and the same can be said about the batting. Tagnarine Chanderpaul scored 52 and 62* while nightwatchman Gudesh Motie led the first innings with 72 not out, Chanderpaul Hemraj scored 79, and skipper Leon Johnson 61 in the second innings ensured an eight wicket triumph. But it were the pacemen who led the charge against Barbados Pride, with Youth World Cup winning seamer Keemo Paul 5/59 and 4/63 and Keon Joseph 3/69 and 4/38. Only Kenroy Williams (68) and Justin Greaves (72) offered any resistance to the Jaguars. 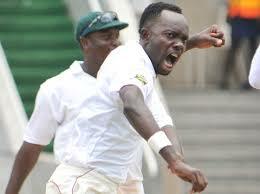 Spinners Ashley Nurse and Jomal Warrican snared three wickets each. WIPCL continues with sixth round action on December 7th with Leaders Jaguars hosting the Volcanoes, Hurricanes will be looking to rebound when they welcome the Pride and Red Force visit the Scorpions. This entry was posted in Headlines and tagged Amir Jangoo, Ashley Nurse, Barbados Cricket, Barbados Pride, Chanderpaul Hemraj, Cricket in the Western Hemisphere, Devon Smith, Fabian Allen, Gudesh Motie, Guyana Cricket, Guyana Jaguars, Imran Khan. Khary Pierre, Jamaica Cricket, Jamaica Scorpions, John Campbell, Jomal Warrican, Justin Greaves, Keemo Paul, Kenroy Williams, Keon Joseph, Kyle Hope, Leon Johnson, Nikita Miller, Roshon Primus, Tagnarine Chanderpaul, Trinidad and Tobago Cricket, Trinidad and Tobago Red Force, West Indies 4-day Cricket, West Indies First Class Cricket, West Indies Professional Cricket League, Windward Island Volcanoes, Windward Islands Cricket. Bookmark the permalink.